Mount Kenya plays a crucial role in the life of the country being Kenya's single most important permanent watershed and her largest forest reserve. The fertile soils of its lower slopes also sustain the growth of the nation's richest farmlands whilst much of its vegetation is globally unique. In recent years, however, the Mountain has suffered greatly from the adverse effects of deforestation, resulting in large tracts of its lower slopes being entirely denuded of trees and occupied by squatters. And, although much of the vast forest cover remains intact, the growing demand for timber (Kenya's staple construction and fuel source) threatens to lead to even more serious deforestation and subsequent soil erosion. Over half of Africa's forests have been destroyed, in this century alone, by means as varied as illegal logging, charcoal burning, agricultural encroachment, 'land grabbing' and the unscheduled de-gazetting of supposedly protected forest areas. Indeed recent estimates state that only 2.9% of Kenya's original forest cover still exists. There is also evidence that not only is the water-catchment area suffering, but also that the montane glaciers have shrunk so rapidly over the last 20 years that some of them have completely disappeared. Finally the popularity of trekking and hiking holidays on the mountain is placing enormous pressure on the natural environment thanks to the attendant ills of tourist refuse, forest fires, feeding wildlife, off-road driving and erosion of climbing routes. Mount Kenya represents the ancestral home and heartland of the Bantu-speaking Kikuyu people, Kenya's largest ethnic group. Heavily influential throughout Kenya's history, the Kikuyu were instrumental in leading the fight for independence, provided the country with its first President, Mzee Jomo Kenyatta, and have forced the pace of all subsequent political developments. 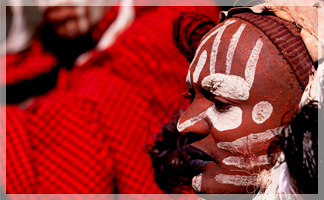 The original Kikuyu are thought to have migrated from the east and north-east of the continent in the 16th century. Because land was the dominant factor in their social, political, religious and economic life, however, this brought them into conflict first with the Maasai and then with the European settlers, who seized large tracts of their territory. That said, the Kikuyu have adapted to the challenges of Western culture more successfully than any other tribe and are enlightened businessmen and successful and progressive farmers who grow coffee, tea, pyrethrum horticultural crops, vegetables and flowers for the export market. Traditionally the Kikuyu have always believed that Ngai's (God's) most frequent resting place is on 'Kirinyaga' or Mount Kenya and although Christianity has altered these beliefs there are still many churchgoers who maintain that their ancestors control their destiny thanks to their closeness to 'Ngai'. Today the Kikuyu remain at the forefront of Kenyan development as both successful business people and formidable politicians. Climate July to August marks the Kenyan winter. Broadly speaking, January-February is dry. March-May is wet. June-September is dry. October-December is wet, the rains passing in time for Christmas. An extinct volcano, some three and a half million years old with permanently snow-covered, ice-shattered peaks, Mount Kenya is the second-highest mountain in Africa after Tanzania's Mount Kilimanjaro. 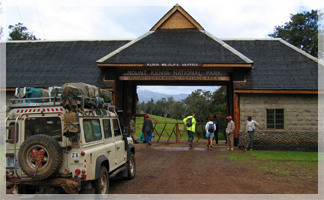 There are four main routes of ascent, the Naro Moru trail, the Burguret and Sirimon trails and the Chogoria trail and, whilst the icy peaks of Batian (5199m) and Nelion (5,189m) are accessible only to experienced mountaineers, Point Lenana (4,985m) can be conquered by anyone who is reasonably fit.